ILAE Genetic Commission weekly. As you might already know, Beyond the Ion Channel has become the official blog of the Genetics Commission of the International League Against Epilepsy. Starting with this post, we would like to publish a weekly post about the issues relevant to what the ILAE-GC does. We’ll kick off this new segment by telling you about the reasons behind the Genetic Literacy Series that is currently in the works. This series of 10 papers will appear this year and next in Epilepsia. Three reasons. Literacy in a wider context is defined as the “lifelong, intellectual process of gaining meaning from a critical interpretation of the written or printed text” (Source: Wikipedia). Consequently, genetic literacy may be interpreted as our ability to derive meaning from genetic data, to translate the report from CNV analysis, gene panels or exomes into action items for patients. Here are the three main reasons why this kind of literacy will probably be important for many aspects of epilepsy treatment. 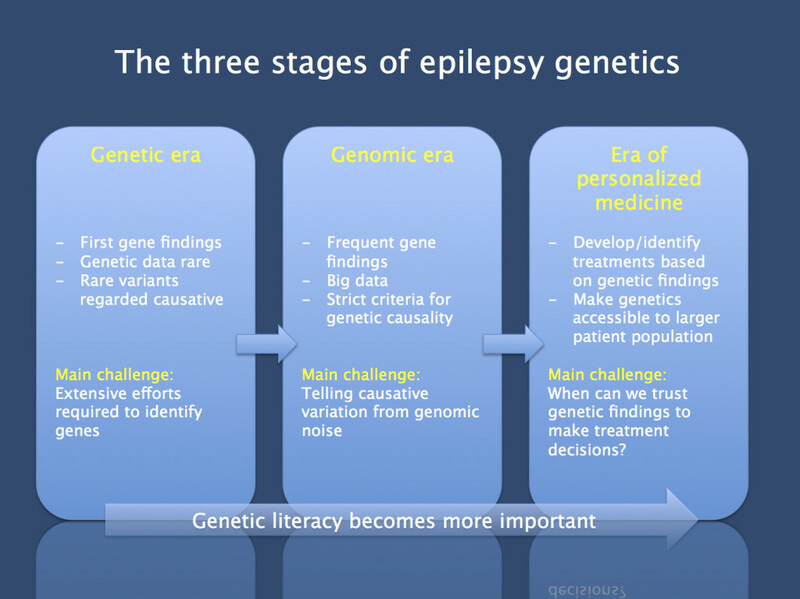 The three stages of epilepsy genetics. This diagram is of course a simplification, but should indicate that the focus of epilepsy genetics is shifting. While we were happy to have any genetic data at all in the genetic era, we are currently flooded with genetic information given the availability of massive parallel sequencing data in the genomic era. In the upcoming era of personalized medicine, we will need to develop new criteria about the “trustworthiness” of genetic data for treatment decisions. Reason 1 – (R)evolution is in the air. The progress of genetic research can roughly be subdivided into three different stages: the genetic period, the genomic revolution and era of personalized medicine. During the genetic period, genetic findings were rare and data was scarce. Some causative genes were identified, but the bulk remained unknown. With the advent of the genomic revolution, genetic data became easy and far less expensive to obtain. A large number of genes are currently identified, but we also realize the perils and pitfalls of genomics – genetic data can easily overwhelm you. Nevertheless, we are finally capable of explaining a notable fraction of the epilepsies through genetic findings. This sets the stage for the era of personalized or individualized medicine: it’s our task to explore the potential for customized treatments for genetic epilepsies, many of which are intractable epileptic encephalopathies – and this is the point in time when epilepsy genetics will be relevant to you. Reason 2 – We would like to help you. We’re the ILAE Genetics Commission and explaining epilepsy genetics is one of our tasks. We are (1) working on a series of papers on this topic, (2) plan to build an easily accessible database geared towards clinicians and healthcare providers (the “Epilepsiome“), and (3), there is this blog, of course. We’ll make sure there are various entry points for you to enter the world of epilepsy genetics. Our vision is to condense the relevant information in a “this is what you need to know” manner. Reason 3 – We are all illiterate. Using the phrase “genetic literacy” should not imply that explaining epilepsy genetics is a top-down approach that aims to educate the illiterate. I think that discussing genetic literacy is an open-ended, iterative approach, especially since the field is very dynamic and today’s body of knowledge is different from what we knew yesterday. There is no defined curriculum, we all have areas of epilepsy genetics that we know little about. For example, my personal “blind spots” are neurometabolics and brain malformations. Therefore, if you feel that the area of epilepsy genetic is overwhelming and that you’re illiterate – I know what you’re talking about. This entry was posted in 2014, ILAE Genetics Commission, Opinion and tagged epilepsiome, exome sequencing, gene panel analysis, genetic data, genetic literacy, Genetics Commission, genomic revolution, ILAE, International League Against Epilepsy, personalized medicine. Bookmark the permalink.